This recipe definitely ranks in the top ten of my favorites for entertaining, because it is utterly easy, utterly reliable, utterly delicious and takes a grand total of 15 minutes to cook up. 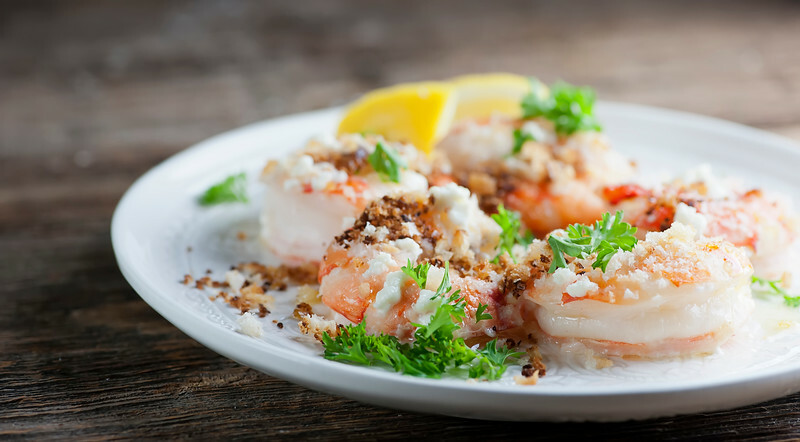 Tender shrimp, sassy feta cheese, crispy crunchy breadcrumbs, served up with a sprinkle of parsley and a squeeze of lemon juice. We are talking supper heaven here. And ps, if you don’t have a dinner party in your immediate future, this is is just as good on a regular old weeknight. Let’s make it!As with any recipe that you make with just a few ingredients, you want to make sure each and every one is as good as it can get. You want the nicest extra large shrimp you can find…I try to go for the wild caught ones at my neighborhood supermarket’s fish counter. Same for the feta cheese – head for the cheese counter instead of getting the pre-crumbled stuff. And fresh breadcrumbs are so easy to make – just drop a couple of slices of bread in your food processor and give them a whirl…instant perfect bread crumbs. The shrimp roast up with a drizzle of olive oil and some of that cheese, and in the meantime you can be toasting up your breadcrumbs, and before you know it, you will be sitting down to a warm plate of cheesy, shrimpy deliciousness! And basking in the adoring compliments of your fellow diners of course. Don’t tell how easy it is! Preheat oven to 450 and line a rimmed baking sheet with foil. Lay the shrimp on the pan in a single layer and drizzle with olive oil. Scatter half of the cheese on top of the shrimp and roast for 10 minutes or until pink. While the shrimp are roasting, heat 2 tablespoons of olive oil in a skillet over medium high heat. Add breadcrumbs and a pinch each of salt and pepper and stir until crumbs are golden and crispy. Divide shrimp among plates and sprinkle with crumbs, parsley and the remaining cheese. Drizzle with a little more olive oil and serve with lemon wedges on the side. This is the kind of meal I’m always looking for when entertaining during the summer Kate! Anything that looks this good and takes less than 15 minutes and is a winner in my book! Shrimp is one of my favorite appetizers to serve too, because they cook up so quick and the ways you can serve them are pretty endless. I am LOVING this roasted shrimp, Kate! You really did them up right and loaded them with flavor! Totally adding this to my entertaining rotation… and to the dinner rotation, because I could definitely just eat a platter of these for dinner! YUM! Cheers! And you deserve All The Shrimp, my friend! Shrimp is one of my favorite, easy meals to make! I haven’t made it in such a long time though, so I’ve got to try this version. Love the feta and breadcrumbs, such a great topping! We are once a week shrimp-eaters in my house! You are absolutely the master when it comes to fish and seafood recipes. They all look so good, and I’ve always had a soft spot for shrimp. Absolutely stunning! Aw, thank you!! I do love my seafood. Hey, Kate, these look great! Bread crumbs coating is a great idea. I know these must be extra flavorful!!! 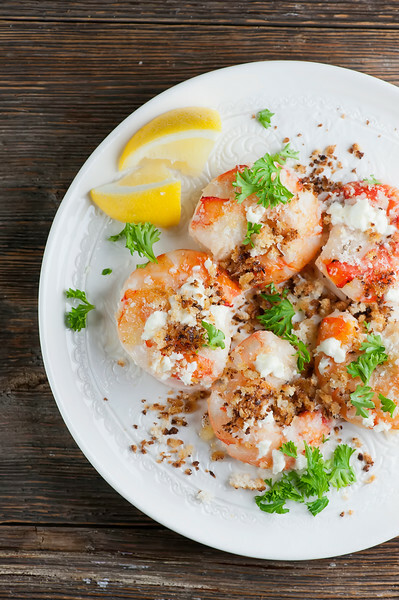 Shrimp are one of our favorite meals and your roasted shrimp with the feta and crumbs sounds terrific. Can another cheese be used to get a good flavor? Feta and Blu Cheese are not favored in my home. Thank you…I will try the parm…no place around here to get goat I don’t think. But I will look for it.